Medical nanotubes are just about ready for use in delivering minute quantities of medicine at exactly the right spot in the body, according to University of Florida scientists. There is just one problem. How do you remove the amino/aldehyde "cork" from the top of the tube? In science fiction, it would be easy - just ask Raquel Welch. In the 1966 film Fantastic Voyage, a hand-picked crew is placed inside a mini-submarine, reduced in size and then injected into the body of a dying science researcher. They must journey to a specific spot in the scientist's brain to administer a treatment. According to the novelization of the movie, by science fiction writer Isaac Asimov, the people are roughly the size of a bacterium. At that scale, a person would be about 1000 nanometers tall. University of Florida chemistry professor Charles Martin, along with five researchers, found a way to cap one end of a nanotube, creating the classic test tube shape, in 2004. Now, they have found a way to temporarily "cork" the other end, creating a miniaturized drug delivery system. The researchers found that if they applied an amino chemical group to the mouth of the tubes, and an aldehyde chemical group to the corks, the two complementary groups would bind to each other, and seal the nanotube. Medical nanotubes are approximately 80 nanometers (or about 80-billionths of a meter) in diameter; billions of them would fit on a postage stamp. Each tube can hold about five million drug molecules. And you don't need a miniature submarine to put the nanotubes right at the site of the problem. Unfortunately, it turns out that there is no easy way to unlock the amino chemical group from the aldehyde chemical group. 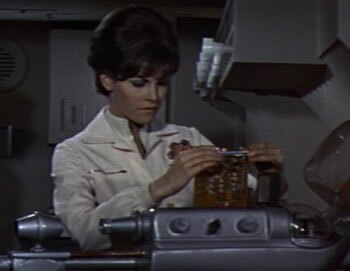 Now, if I'm doing my math correctly, that means that, to the miniaturized Raquel Welch, the nanotube would have (relatively speaking) about a four-inch diameter. So, opening the medical nanotube should be about as easy as opening a wide-mouthed jar of pickles, or opening a can of nuts. Yes, yes, I know; it's just a movie, and there are no nano-Welches. Dr. Martin and the other researchers have come a long way, though; with the ingenuity displayed so far, I'm sure they will find a way to open the nanotubes. Even without Raquel. If you are looking for more (nearly) science-fictional medical miracles, take a look at Remote control for humans, real-life bionic arms and lab mice that unexpectedly regenerate limbs and organs. Read more about corking nanotubes here.